Jeff Britton and his wife Jenny Walker began the "Be the Change Project" in 2007 with their "Climbing for Kenya / Trekking for Tanzania" fundraising project which received local, regional and national media coverage. Jeff and Jenny continue to raise funds through their own grass-roots efforts, and also assist schools and organizations wishing to raise funds and contribute to the project. All donated money goes directly toward projects at Orkeeswa Secondary School in Lashaine Village, Tanzania, most specifically toward ensuring the highest quality of education and health services for their students. 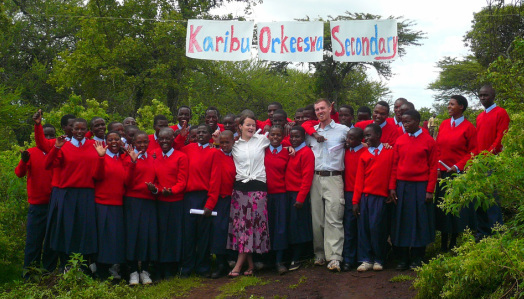 Jeff and Jenny are proud to have been the first teachers when Orkeeswa Secondary School opened on April 14th, 2008. Tanzania is recognized as one of the least developed nations worldwide, with only 7% of Tanzanians having the opportunity to complete secondary school. OSS is Lashaine Village's first and only secondary school, developed by the Indigenous Education Foundation of Tanzania (IEFT), an American-registered 501(c)(3) charity and registered Tanzanian NGO. The organization strives to preserve the past while ensuring the future through education. OSS now has over 200 students, each with a genuine desire to learn and better themselves and their community. With their education they want to help their poverty-stricken village grow and survive. The time is now to "Be the Change!" If you or your school / organization would like to contribute or help raise funds for Orkeeswa Secondary School, please do not hesitate to contact Jeff ... he and Jenny will be happy to discuss ways you can get involved to help "Be the Change!" For more information about the Indigenous Education Foundation of Tanzania, you can visit their website directly HERE.